Four years since the day she was born just after dawn ~ not yet ours though our hearts burst with love for this unbelievably magnificent child, and the amazing young woman who brought her into the world. Four years ago we welcomed our daughter as a universe of love surrounded her. We were forming a new family ~ a beautiful one that defied and yet would be inextricably linked by blood, one that was chosen. Four years ago I became a mama when this precious child was entrusted to our care ~ and every day since I have felt such enormously humbling gratitude. From brand newborn to adorable baby and curious toddler, now in preschool and next year Kindergarten, our sweet girl is growing into such a marvelous little person ~ smart, clever, funny, creative, kind, sweet and strong. It will always be my privilege to share this life with her, to help guide her to become the person she is. 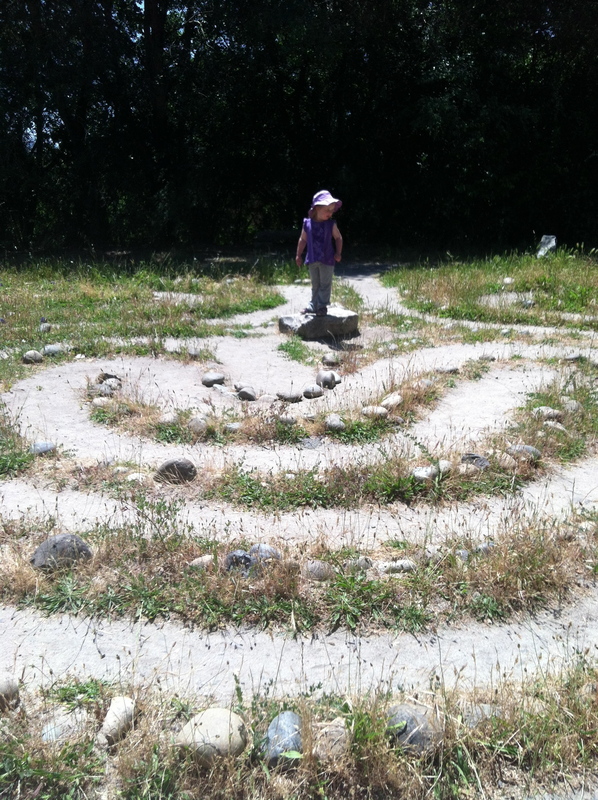 Anyone who remembers Jaye’s birth story may remember a labyrinth or two. Here’s Jaye at the middle of her own. Happy 4th birthday, sweet Jaye ~ you make the world a brighter and more lovely place. We love you forever and ever and always! ~ by luna on May 30, 2013. Hard to believe she’s for already. Happy birthday Jaye! Love this! Happy Birthday, Jaye! I was just getting really emotional thinking about how my own #1 is so special in that he made me a mom. Happy fourth birthday Jaye!! I do remember the birth post. Wow..time flies. Luna, I also want to thank you for your beautiful blog. Your strength and your journey inspires me and gives me hope. I am so happy that your family is complete. It gives me comfort to know that there is a light at the end of the tunnel and when you get there, the struggle will make you cherish and appreciate life and love even more. Love your writing. So evocative. Happy Birthday to your big girl! Theo is coming up right behind her at the end of July. Beautiful, beautiful post. You write so lovingly about Jaye’s birth mama, it warms my heart. You are amazing.